Coby is not exactly the device manufacturer we often write about - with an emphasys on affordable and often cheap, it’s been a bit out of our scope, but it recently announced not one, two or three, but five new tablets running on Android 4.0 Ice Cream Sandwich (ICS). What makes things different from Coby and other manufacturers with similar profile is ICS. Previously, such companies would release mostly (if not exclusively) Android 2.x tablets, with an ugly stretched out UI, not designed to fit tablets. ICS is a whole different story - it’s made for tablets, and paired with the promise of an affordable price could end up being a killer combination. Coby says it will officially life the cover off “five standout introductory models” at CES 2012. 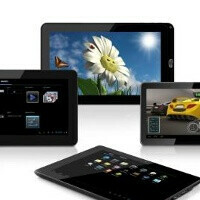 The prices of the tablets will be “incredible” when they land on shelves in the first quarter of 2012. Coby’s MIDXX42 lineup consists of 7- (MID7042), 8- (MID8042), 9- (MID9042), 9.7- (MID9742) and 10-inch (MID1042) tablets. Interestingly, all of that comes stuffed with 1GHz ARM Cortex A8 CPUs and features capacitive multi-touch screens, varying RAM with up to 1GB on some models, expandable memory via microSD cards of up to 32GB, Wi-Fi and 1080p HDMI output. Could Coby really be up to something here? Chances are you'd have to make do with a thicker body and not exactly cutting edge design, but if priced right, would you consider a Coby tablet? I wish Phone Arena would review some of these products. I know they're not as high end as Apple or Samsung (hell, even BlackBerry) devices, but it would be nice to see products of this caliber get some attention on this site. Possibly even some NextBook products. Just a thought.